Métis fiddling is a style all it's own, and, when you think of this unique cultural music, one fiddler stands out! 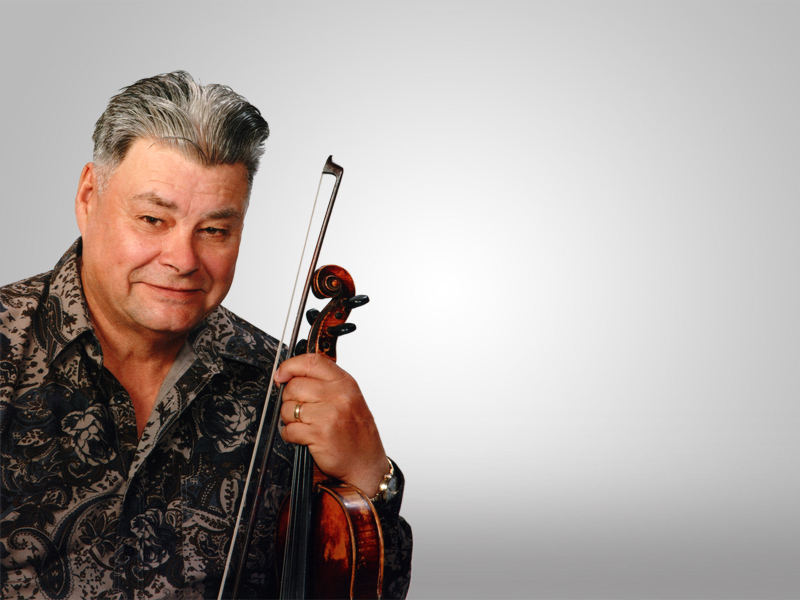 John Arcand is the undisputed "Master of the Métis Fiddle". Originally from the Debden - Big River area of Saskatchewan, John now makes his home on acreage southwest of Saskatoon. He started playing fiddle at the age six, with coaching from his Father and Grandfather and by age twelve he was playing for dances. His impeccable sense of timing and flowing rhythm comes from learning to watch the dancers feet at this early age and from this he developed and refined a style of playing that has helped him become a legend in the fiddle world. People often refer to him as the "dancer's choice"! John has made sixteen recordings to date, and still plays and records the Traditional Métis tunes of his Father and Grandfather as well as those he continues to research, learn and pass on. He is also a prolific writer having composed over 390 original tunes. Along with a busy performing schedule, John is active as a guest artist and judge at fiddle contests, is in demand as an instructor at many fiddle camps and has a growing list of private students. He and his wife travel extensively promoting the Métis culture through workshops and performances and do many school and youth presentations each year. John is an avid collector of fiddles and accessories and a qualified Luthier who has been making fiddles for many years. The art of fiddle making is not a common one and his "original" instruments are much sought after. He also offers repairs and can provide appraisals. John has spent his lifetime promoting and preserving the traditions of Fiddle Métis and Dance and old time fiddling. His contribution to the music world encompasses the preservation of these traditions, and his on-going efforts to offer a venue where all of this can be seen, appreciated and shared - The John Arcand Fiddle Fest. Held annually on the second weekend of August on his acreage, the John Arcand Fiddle Fest has become one of the major fiddle events in Western Canada. His proudest achievements include being selected as one of 27 people world wide to represent Western Canada at the Fiddles of the World Conference in Halifax in 1999. Being chosen as a delegate in an Irish/ Métis Cultural Exchange in 2001 where he played for and met the President of Ireland. And, of course playing for and meeting the Queen at the Lieutenant Governor's Centennial Gala in Saskatoon in 2005. His passions for the preservation of the Métis Traditions, old time fiddling and work with youth have been recognized by his peers and resulted in him being honoured with a National Aboriginal Achievement Award for Arts and Culture, and a Lifetime Achievement Award for his "Outstanding Contribution to Old Time Fiddling." from the Canadian Grand Masters in 2003. In 2004 he was awarded the Lifetime Achievement Award in the Inaugural Lieutenant Governor's Saskatchewan Arts Awards. In 2005 the Province of Saskatchewan honoured him with the Saskatchewan Centennial Medal, and in the Spring of 2006 he received the Cultural Diversity and Race Relations "Living in Harmony" Award from the City of Saskatoon. In April of 2008, he received the Order of Canada - our country's highest civilian honor. To see John perform is to see a man serious about his music and in harmony with all that is good. From playing for the Queen of England to "jamming" with regular folk - John is happiest and most at home with a fiddle in his hand.